Need more information about booking Home 7298266 ? Welcome to an unique residence in Stockholm/Enskede which combines 60s interior design with functionality, comfort and access to nature. The spacious house has a large well equipped kitchen, 6 bedrooms, 2 bathrooms, the Penthouse with separate bath and pentry, a porch and a terrace. The large property has a designed garden and space for numerous cars. 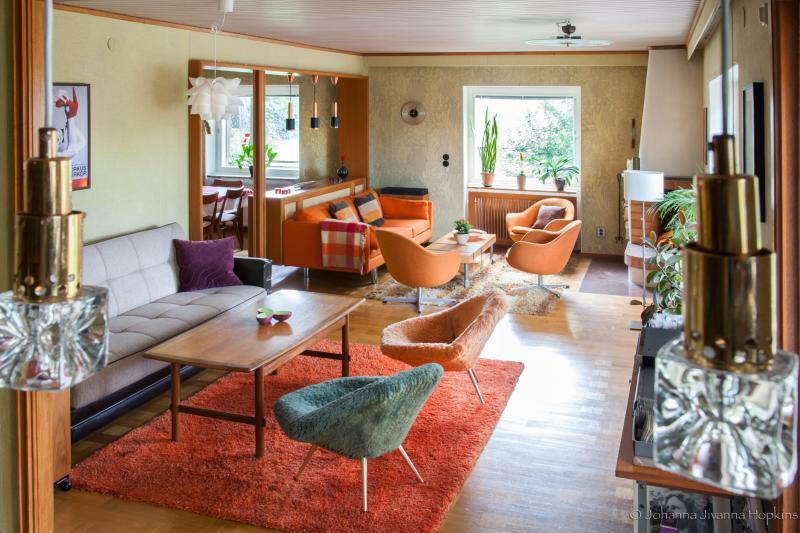 The house was built during the 50s/60s by wealthy engineer Lars Berkle who, having a passion for interior design and technical solutions, did not spare any effort to craft every detail of ”Villa Berkle”. Even though the property is situated in a quiet part of Stockholm with forest right out the backdoor you will easily reach by feet a well equipped supermarket, several restaurants, a bakery, a night opened 7-eleven store and 2 alternative subway stations(15 min to south city Södermalm). Stockholm International Fair is nearby, 8 min by car or 10-15 min by bus. There i several lake sites available. With 5 years of experience of letting my home to private- and commercial guests I am looking forward to welcome you and to do what I can to give your stay in Stockholm a silver lining. Please leave the house with all accessory and fittings put back into their place, sheets and beddings are left on beds. Smoking is allowed on terrace and porch. Dinners and get-togethers are ok but only for up to 15 people and with respect to neighbors. Please do not use trampoline during the cold season, no smoking near the trampoline, please! You can get in touch with Janu (the owner) through the contact form on this page. Send Janu (the owner) an email through the contact form on this page. Alternatively, if there’s a phone number on this page, you can call them. How do I contact Janu (the owner)? If you’ve already booked, go to Manage your holiday booking to view Janu the owner's contact details or send them a message. Or send Janu (the owner) an enquiry through the Contact the owner/manager form if you’d like a quote or more info first. When you pay online through the Book your stay form, a booking request is sent to Janu (the owner). You’ll find out within 24 hours whether they’ve accepted - no money will leave your account before then. You can also request a quote from Janu (the owner) through the contact form. The owner will email you the total cost for your dates and a link to book and pay online. Use the Book your stay form to pay provisionally online. You can pay by credit/debit card or PayPal. Janu (the owner) will have 24 hours to accept the booking and no money will leave your account before then. Why can't I call Janu (the owner) before booking? You’ll need to contact Janu (the owner) to do this. Send them a message in Manage your holiday booking or through the contact form on this page. You can request to change the dates or number of people on your booking via the Manage your holiday booking page. To change your holiday dates use the Edit booking button. If you need to change the number of guests staying then send Janu (the owner) a message. If Janu (the owner) agrees, they’ll send you a revised quote outlining the changes. You can review and accept/decline this from the Manage your holiday booking page. You’ll have 48 hours to take action before the revised quote expires.